Pour the Rose Water in one Large Martini Glass. You spin the Liquid in order to set the glass. Delete the unnecessary part. Shake with Ice all the Ingredients, except the Petals. 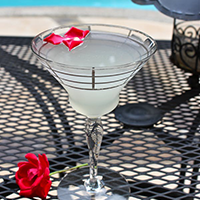 Filtered into Large Martini Glass, decorated with a Rose Petal if available.